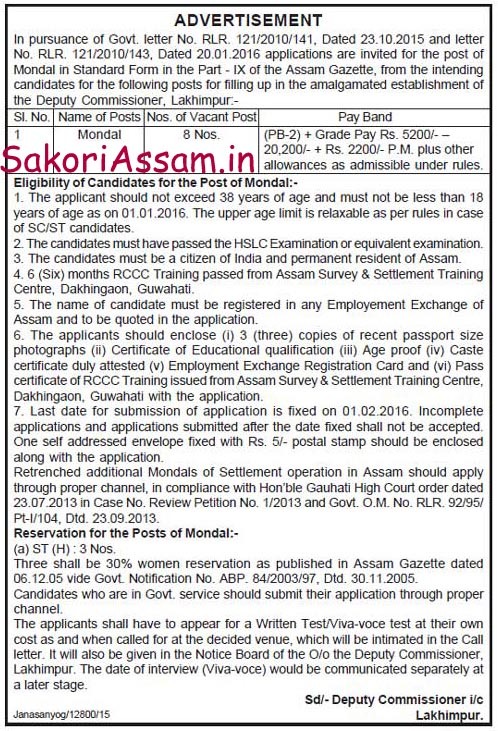 Applications are invited for the post of Mondal in Standard Form in the Part-IX of the Assam Gazette, from the intending candidates for the following posts for filling up in the amalgamated establishment of the Deputy Commissioner, Lakhimpur. The last date of application is 1st February, 2016. Educational Qualification: The candidates must have passed the HSLC Examination or equivalent examination. 6 (six) months RCCC Training passed from Assam Survey & Settlement Training Centre, Dakhingaon, Guwahati. Age: 18 to 38 years as on 01/01/2016. The upper age limit is relaxable as per rules in case of SC/ST candidates. The name of candidate must be registered in any Employment Exchange of Assam and to be quoted in the application. i) 3 (three) copies of recent passport size photographs. iv) Caste certificate duly attested. vi) Pass certificate of RCCC Training issued from Assam Survey & Settlement Training Centre, Dakhingaon, Guwahati with the application. Incomplete applications and applications submitted after the date fixed shall not be accepted. One self addressed envelope fixed with Rs.5/- postal stamp should be enclosed along with the application.